A strange thing happened as I began playing Assassin’s Creed Odyssey: I felt proud. Many games have borrowed Greek themes or settings, particularly those tied to ancient myths, but the culture is rarely represented accurately. Assassin’s Creed Odyssey isn’t a perfect game, nor is it wholly authentic in its portrayal of Greek culture, but Ubisoft’s decision to cast Greek voice actors was brilliant. It was something I didn’t know I needed, and most players probably didn’t notice. My name is Alex Kalogiannis, and I’m Greek. You might have been able to put that together after hearing my name. I’m the son of immigrant parents, both of whom are from Greece. I’m the type of Greek American who struggles with speaking the language and can’t really read its alphabet, but still swears in it when I stub my toe. I haven’t been back to “the old country” in over a decade, apart from a work trip, but I scream internally when someone orders a “gyro” as JY-ro and not YEE-ro. Think of hearing someone pronounce the L’s in “tortilla” and you’ll get what I’m talking about. As for many Americans, my ethnicity is a big part of who I am, and it informed the culture in which I grew up. I hadn’t thought about my Mediterranean background when I read pieces about the importance of representation in video games, but representation was all I could think about after playing Odyssey. 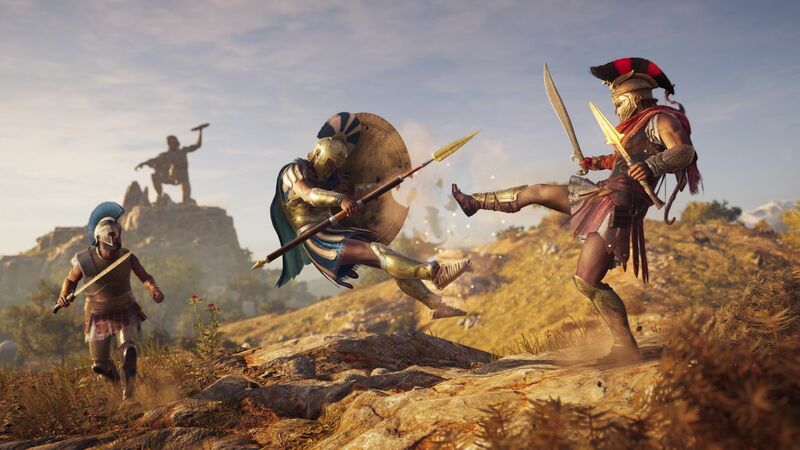 Assassin’s Creed Odyssey is a game that takes place in ancient Greece and, like other games in the Assassin’s Creed franchise, it’s meant to be a playground more than a cultural learning tool. I was excited for the game as a fan of the series, but I felt no significant connection to it until I started playing. This isn’t new for me; I never have high expectations when it comes to games with Hellenic trappings, such as the God of War series. Those expectations have been tempered by films like Troy, where all the main characters tend to have Scottish accents or speak in Oxford English as Greek extras fill the background. I’m resigned to the fact that the historical reality of Spartans will be forever colored, however flatteringly, by the film 300, a hyper-stylized movie based on an exaggerated graphic novel. Pop culture rarely knows what to do with Greek stories outside of making sure the audience knows that the characters are “foreign” in some nebulous way. And the thing was that I didn’t care, or at least didn’t care that much. Authenticity wasn’t anything I really expected or even hoped for. Would it matter? Can you imagine Kratos being as awesome if it weren’t for Terrence C. Carson or Christopher Judge, for example? I’m not trying to criticize these games or movies; I grew up playing or watching them, respectively, and was often a fan. The trailers for Odyssey seemed to confirm that the game would contain the influences and cliched stylistic choices I grew up with. Brad Pitt’s hop-skip-stab from Troy was there, as was the 300-style Spartan kick. So many fictional choices from other movies are now repeated because they’ve become shorthand for Greek culture, even if they have nothing to do with our actual history. To my great surprise, most of these irritations melted away in the background as soon as the voice acting in the game started to take center stage. And suddenly I got it. This is what actual representation feels like! And it’s great! I chuckled at the anticipated first cries of malaka, the go-to Hellenic swear word. It’s our most loaded and oddly versatile swear, so it’s the one we most heavily use. It’s also the one we teach everyone first, so its presence was expected. But as I played on, it was the more nuanced aspects of the voice work that I recognized as genuine. The voice acting became the most exciting part of the game for me, and it introduced a metagame in my head. I began scrutinizing every conversation with even the most random NPC, trying to guess if they’d get the word in the subtitles right. I even began picking up on the dialects of each actor. I don’t know them well enough to place them in a region, but I could at least recognize them as being distinct from each other. I was hearing people who sound like my uncle. Folks who sound like family friends, cousins, and my community. And the sense of familiarity immersed me deeper into the game. I was hearing myself, and moreover, everyone who was playing this game was hearing it as well. My friends were getting an earful about how happy I was about the voice acting whenever they asked me about the game, to the extent that I rarely talked about the gameplay itself. “Now you see how I feel,” many of them told me. The importance of seeing yourself properly represented in games and other pop culture was something I surely thought I understood, at least academically, but it’s easy to miss the significance of someone stating “this means something to me” when you can’t feel it yourself. My conversations with my friends about my reaction to Odyssey made me realize I wasn’t a bystander when it comes to representation in media; I was a part of it. I had been missing something too, but I never put it all together in my head. I finally understood why I was getting so cheesed at movies getting “the Greekness” all muddled up, and I couldn’t help but think of a particular cultural albatross around my neck. Did you see My Big Fat Greek Wedding? Did you like it? I didn’t, although I’m not upset if you enjoyed it. It was a film by a Greek writer with the best of intentions, trying to tell a story of growing up Greek in the U.S. It’s meant to be a fun, goofy exaggeration of her experiences, and I remember the Greek community here in New York being thrilled about it for the same reasons Odyssey suddenly excited me so much: representation. It was ostensibly made by Greeks, about Greeks, but it was a farce. I didn’t feel like I was seeing myself or people like me on the screen, and I know many people who felt the same. And the problem was that the farce is now what people think is true. Windex jokes. Bundt cake. My Big Fat Greek Wedding is the Greek version of how Crocodile Dundee treated Australians. When these stories hit the mainstream, people outside your culture don’t know which parts are genuine and which bits are fantasy, a joke, or exaggerated. We all want the best elements of our culture to be seen, but there’s nothing wrong with being critical as well. The problem was that My Big Fat Greek Wedding didn’t make fun of anything that felt real; it set up stereotypes and then laughed at them. It’s not even that Odyssey is incredibly accurate — I don’t know enough about the time period to say for sure — it’s that it pulls off feeling authentic. The trappings of Greek culture, if not all the details, are handled well and with some measure of respect. Playing Assassin’s Creed Odyssey taught me a few valuable lessons, even if they’re not about the game. I learned how to better listen when someone says something is important to them, no matter how difficult it is to perceive from my own position. After all, they are telling me it’s important because I can’t see it. Maybe it takes something like a video game, a thing you were just playing for fun, to make you realize unexpectedly that you could relate better than you thought you could all along. That this does have something to do with you. I wish there were a better way to learn empathy without having to go through something similar myself, but experience is often the best teacher. Assassin’s Creed Odyssey changed how I view the discussion around representation, and I want everyone to be able to feel how I felt when I played the game.